Jalapeño, fresh, minced 2 tsp. Ancho Chili Powder, ground 2 tsp. Red Onion, small, thinly sliced 1 ea. Heat olive oil in a Dutch oven over mediumhigh heat. Add onion, garlic and jalapeño; sauté until softened, about 2 minutes. Add chili powder, tomatoes, and barbecue sauce; bring to a boil. Reduce heat and simmer 5 minutes. 5. Add shredded chicken and simmer until chicken is heated through, stirring occasionally. 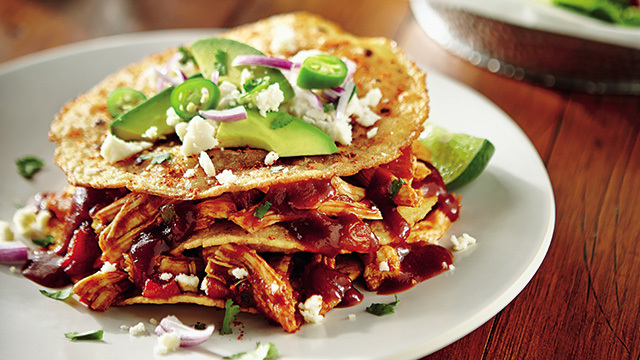 Layer cooked tortillas with cooked chicken.